Come prepared to sing and dance. Callbacks will be 1:00 PM to 3:00 PM on May 11. If you do not receive a call back, it does not mean you do not have a part. For dance auditions, please be prepared to move by wearing appropriate clothing that will not limit your movement and appropriate shoes (no sandals, flip flops, rain boots or Crocs). Dance shoes or sneakers are best! You also may be asked to show off any extra skills you have! Even though this is a kid friendly show, it is not for children only. Come audition with the whole family! There are three songs to choose from. Please choose the song that best fits your range. 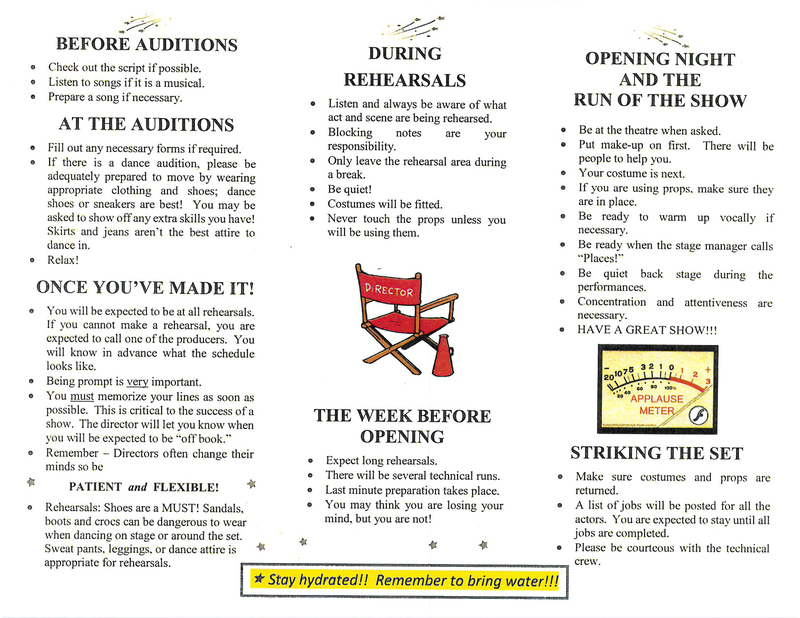 If you wish to be considered for the role of James, you must prepare "On Your Way Home". If you would like to receive sheet music, please email us at lrct_me@yahoo.com or send us a message on Facebook. A strange, magical storyteller. Often inserts himself into the story, in disguise, to help push the action forward. A lonely young boy who lacks confidence. Having lost both his parents in a freak accident, he feels he belongs nowhere in the world. However, when given the right encouragement he becomes resourceful and innovative. A good friend. James' mean aunt. A thief and a scoundrel. Shrewd and opportunistic. Very tall and thin. James' other mean aunt. Also a thief and a scoundrel, but not nearly as bright as her sister. Very corpulent, she often has her mind on food. A normal spider who has become human-sized after eating a crocodile tongue. Her husband was killed and eaten by Spiker and Sponge. A wizened grasshopper who has become human-sized after eating a crocodile tongue. An excellent musician. An ornery centipede who becomes human-sized after eating a crocodile tongue. Hates humans, in part because Spiker and Sponge fumigated his family. Prickly and rude, everyone thinks he is a pest. A motherly ladybug who has become human-sized after eating a crocodile tongue. Respectable and classy, she has a warm, caring heart. An earthworm who has become human-sized after eating a crocodile tongue. A bit of a scaredy-cat. He is neurotic and worried about everything, but is very friendly and brave when called upon. Is this your first time performing? 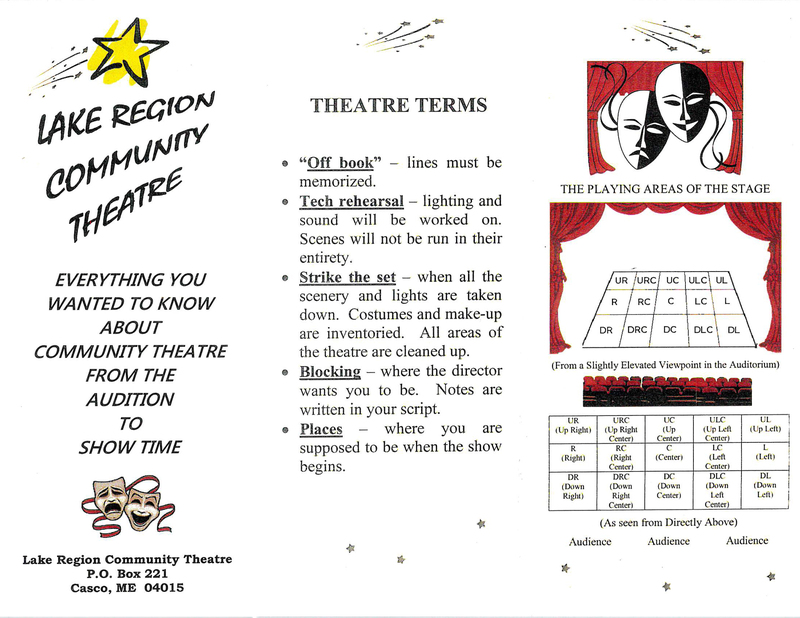 Want to learn more about the show process? Check out our flyer below with helpful information.